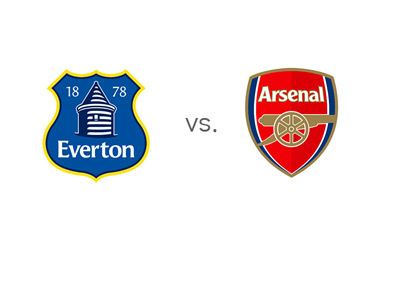 Here are some quick facts about the upcoming English Premier League match between Everton and Arsenal, which is taking place this Sunday, April 6th, 2014 at Goodison Park. For the longest time this season Arsenal were in the running for the Premier League title, but after more than a few slip-ups and with six games to go, they are forced to battle for the number four spot and a place in the UEFA Champions League next season. Arsenal are currently four points ahead of fifth place Everton, who have a game in hand and have won their last five matches. The upcoming game is crucial for both teams. After losing to Chelsea 6-0 at Stamford Bridge, Arsenal drew their next two home games against Swansea 2-2 and Manchester City 1-1. The positive news for Arsene Wenger's side is that both Aaron Ramsey and Nacho Monreal are set to make a return for the team's trip to Everton. In their last three games, Everton beat Swansea 3-2 at home, Newcastle 3-0 away and Fulham 3-1 away. Roberto Martinez is putting his faith into Everton youth and it has been paying off. The twenty year old midfielder, Ross Barkley, is proving to be one of England's brightest young stars. Check out the goal he scored vs. Newcastle. The two teams have met twice already this season. The score in the EPL match at the Emirates was a 1-1 draw, while in the quarter finals of the FA Cup, also at the Emirates, Arsenal were the better side winning the game with the score of 4-1. The game on Sunday should be awesome. Everton are the slight favourites.